Welcome to Ash Brush And Components Private Limited, Manufacturer and Exporter of fine Art Brushes, Makeup Brushes, Hobby and Craft Brushes and Forensic Brushes. The company was incorporated in the year 1969. Our state-of-the-art infrastructure helps us to export to America, Europe and Asia. Customization, excellent logistic support and diligent workforce make us stand apart from also-rans. We offer a splendid range of Fine Art, Forensic and Cosmetic Brushes. Our Fine Art Brushes are well known for their durability and reliability. 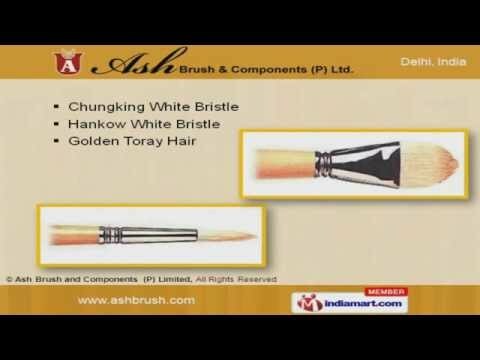 Chungking and Hankow White Bristle offered by us are extremely reliable. Our Forensic Brushes are in huge demand across the global markets. We also provide Hobby and Craft Brushes that are best in the industry. Along with that we offer Cosmetic Brushes that are setting a benchmark in the market.